The speaker of the House of Commons has joined the battle to save his local hospital in Glasgow. Michael Martin has taken the unusual step of breaking with parliamentary protocol and is campaigning for Stobhill not to be downgraded. Tradition dictates that the MP should remain neutral on political issues. However, some campaigners suspect the special permission he sought to speak out had more to do with saving his own seat at the next election. 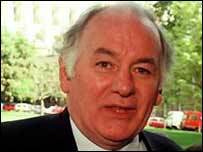 The accident and emergency unit at Stobhill Hospital in Mr Martin's Springburn constituency is due to close in 2005. A high-profile campaign has raged for months and its organisers have pledged to stand a candidate against the Labour speaker at the next general election. Although Mr Martin holds Springburn with a healthy majority of 11,378, the hospital protesters have shown in the past that they can cause problems for established political parties at elections. At the Scottish Parliament election last year, retired GP Jean Turner unseated Labour MSP Brian Fitzpatrick in Strathkelvin and Bearsden. 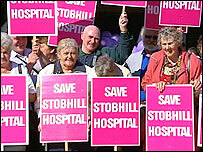 The independent candidate was campaigning against the plans for Stobhill Hospital. On Friday, Mr Martin was quoted in The Herald newspaper as saying: "Stobhill is a beautiful hospital with a dedicated staff on a lovely site with ample room for expansion. "Since it is less than three miles from the Royal Infirmary, it could be a campus site and still offer acute services." Mr Martin is understood to be demanding a meeting with Scottish Health Minister Andy Kerr. He is expected to urge Mr Kerr to place a stay of execution over the plans to axe overnight beds and the casualty unit.